Coming into this final chapter of the Man of Steel's latest origin respin, Geoff Johns and Gary Frank have a whole fistload of plot threads left to wrangle. First and foremost, Superman is still an unknown variable to the common man, a curiosity with great power but uncertain motives. General Lane and Lex Luthor have already seen enough to make up their minds about him, though, and have set out to incapacitate the man in blue at all costs – even if they have to tear Metropolis down around them in the process. 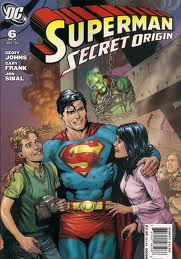 With Lane's troops sweeping into the Daily Planet bullpen and Luthor's Kryptonite-powered Metallo suit crashing down on Superman's back, all signs point to this being an action-packed climax. It doesn't waste any time. While I'm still not sold on the necessity of this series, there's no denying the kind of care Geoff Johns has delivered between its covers. This is more than just a retelling, it's an homage to the core of the character, however naïve and dated it might seem in the present setting. It's also an apt reminder of what comics used to be all about. Underneath the modernizations, the gaudy wardrobe, the convoluted master plans, there's a genuine sweetness, a passion to do the right thing despite the high cost of doing so. It's straightforward, innocent, perhaps a sign of the times in which this basic story was first told, but it's still there and it's still pertinent. Of course, you have to dig pretty deep to find that, because on the surface this is more than a little bland. Though he may be dealing primarily with the enormous issue of basic human nature, (and all the ignorance, xenophobia, disbelief and outrage that it encompasses) Johns's insights fall well short of revelation. In fact, many such lessons, which seem obvious at first glance, are hammered home so bluntly, so repeatedly, that they lose any power they might have carried in the first place. Johns is capable of subtlety – I've seen him flex that muscle repeatedly in his other works – but it's a skill he brazenly neglects in Secret Origin #6. The issue's fight scenes are a strong point, as Johns invents no shortage of giant-sized splash pages for Gary Frank to knock out of the park, but even these aren't free from the writer's dalliances. At one point, Superman pauses right in the middle of his tank-crunching brawl with Metallo to share a full page of redundant conversation with Lois. What was the enemy doing while that was going on? Chatting up a few nearby troops. I guess they called a twenty second time-out or something. Frank's artwork goes a long way toward smoothing over the story's rough spots, adding more depth and character with his pencils than the narrative could deliver with a thousand captions. Fortunately, that's an observation Johns seems to have made over the course of the series as well. In earlier issues, the artist's compositions were difficult to appreciate beneath the stacks of layered word balloons. In this climactic issue, though, that dialog is much more concise and restrained, allowing the stunning artwork to bear the bulk of the load. It blossoms given the opportunity, a show stealer in every way. This issue is something of a conundrum. On the one hand, it's a masterful demonstration of who Superman is, who he was and what he stands for. It enjoys tremendous artwork, a stunning fight scene and a firm, appropriate climax. On the other hand, for all its attempts to modernize the setting, the actual story remains incredibly outdated and narrow sighted. Its dialog is clumsy and unnatural, its narration redundant and heavy-handed, and its conclusion boldly unsurprising. It's a paint-by-the-numbers story, and no matter how good a job Johns and Frank may have done with staying inside the lines, it'll never be more than that. Flip through it and enjoy its merits, but don't linger too long for fear of its shortcomings.